I'm having trouble with COUNTIFS on Google Sheets. I've been able to use SUMIFS and now I need to use COUNTIFS. I tried to do a Find and Replace, changing SUMIFS to COUNTIFS, on what I thought were similar criteria. What are the differences between parameters on SUMIFS and COUNTIFS? More importantly, how do I make the formula work? I'm working on a dashboard that consolidates website and social media analytics data from several offices around the world. We are using Google Sheets for easier collaboration among the communications managers at each office. The dashboard needs to present a table of a number of metrics on a monthly basis. We archive the dashboard at the end of each year, then present to senior management. The data is used to inform global communications strategy. Each office maintains its own website and social media accounts. When the dashboard was initially set up, data was manually entered for all fields. 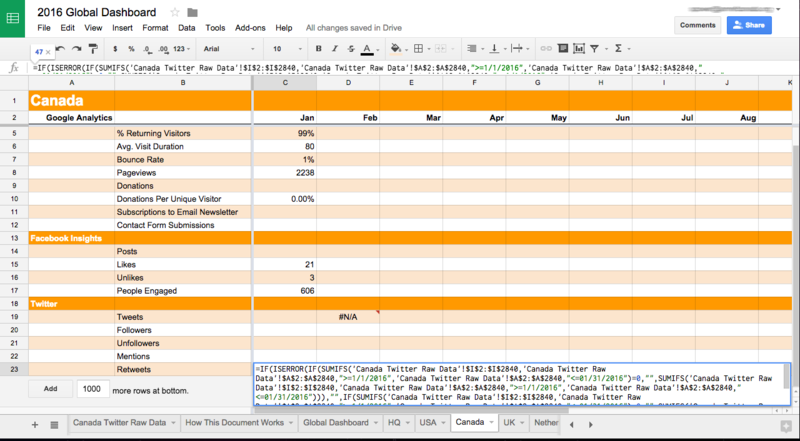 In a separate sheet we run the raw data from the Google Analytics add-on (called 'Canada Raw Data'). The dates run from A15 onward. In the January column in the tab in the screenshot, it basically says, "if the date is after Jan 1 and before Jan 31, include the value in the sum." To keep the table tidy, I've wrapped it in ISERROR. Rinse and repeat for Feb-Dec.
Where I get stuck is in Twitter. I've downloaded a CSV from Twitter Analytics for all tweets so far in January and copied these values to a sheet called 'Canada Twitter Raw Data'. After a few Find and Replaces, I was able to replicate the formula for the new ranges with relative simplicity. Error COUNTIFS expects all arguments after position 2 to be in pairs. What's the best way to populate that Tweets field for each month? Let me know if you would make any other changes to my formulas. How do I modify this Google formula to filter out blank responses from Google Sheets?